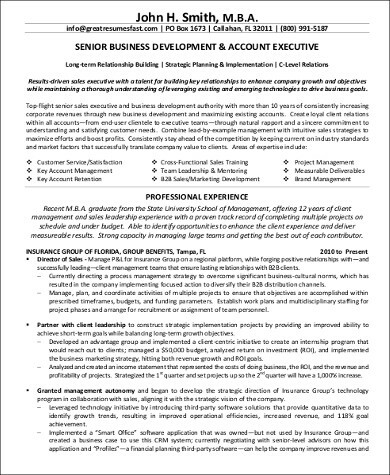 A business development executive is a high-level sales professional. They are senior managers whose functions are focused on developing and making businesses grow. That is one tough job. The hiring companies will surely only choose the cream of the crop among their applicants. Question, how do they choose the best among the best? They do it by utilizing what they have about you, your resume. Yes, you have read it right. That defenseless piece of paper you handed to the recruitment person is the one. What if you didn’t pay attention to your resume or you just plainly didn’t care about it? Then this is the time for change. 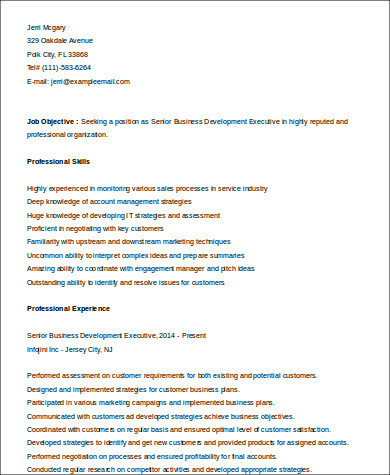 We have business development executive Sample Resumes that will definitely make your resume awesome. Here’s a little know-how about the different types of resumes. 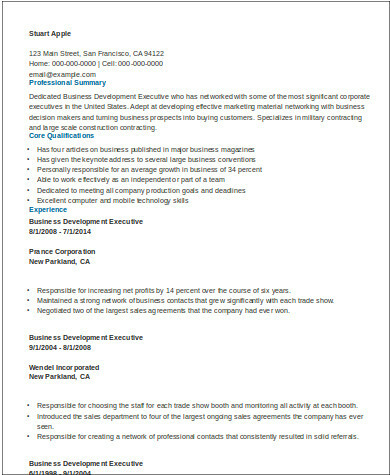 Please also see our Sample Executive Resumes. Functional – The primary focus of this resume is to highlight your skills and experiences, and your employment history is second priority. 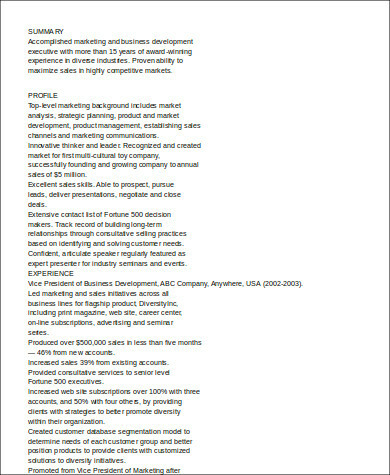 This resume is effective if you the have a diverse background but don’t have a clear career path. 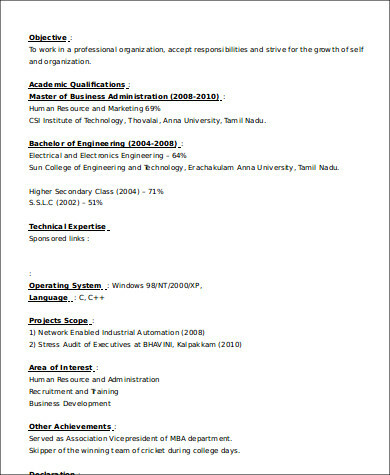 Chronological – It is the most commonly used resume format. It allows you to list all of your employment history in chronological order, that is why it is also the type that is mostly preferred by employers. Combination – Details of both skills and experiences are written together with the employment history. 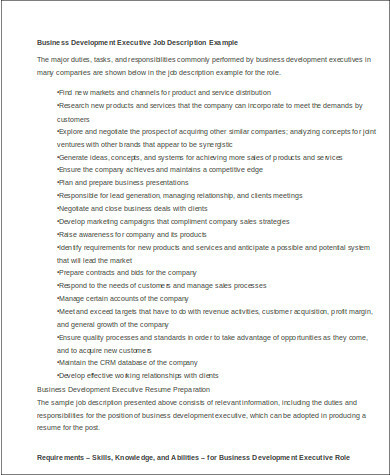 This type of resume is used to show the hiring company the type of employee you are. 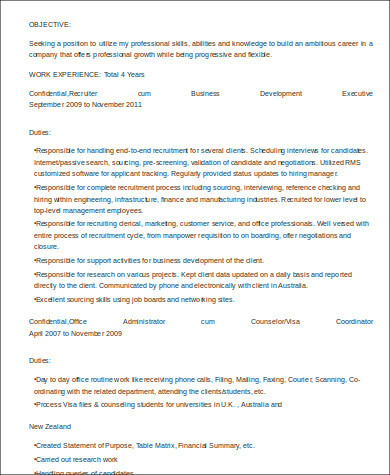 Resume with Profile – A brief summary about the applicant is written in this resume type. It helps to sell themselves to the company they are applying for. 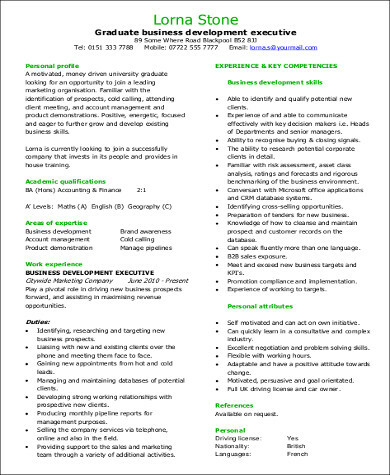 Targeted Resume – Used if you are applying for a specific position in a company. 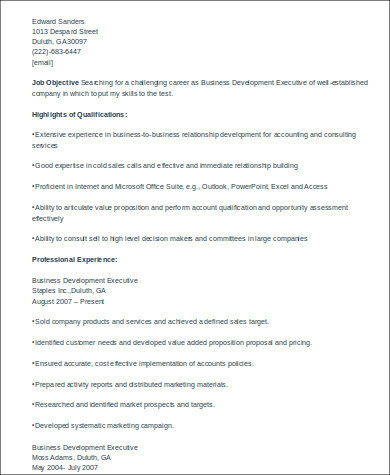 The details of this resume is customized to fit the job description or the position that is hiring. The disadvantage is that it is time-consuming. On the other hand, your efforts will be worth it since it can generate good results. The competition is tough among applicants, especially for those applying for executive positions. So what can you do to be able to get the job? You just need to make not just an impressive resume, but an impressive and effective one. Here are a few helpful tips. You may also find our Sample Business Resumes helpful. You should start off with writing your name legibly on top of your resume, including your contact details. You may write it in bold letters and in a bigger font size. Use font styles that are easy to read. Choose a resume format that yous see as advantageous to either the position you are applying for, your skills, your background, or your experience. You can use a maximum of two fonts styles, but not more than two. If you want to have certain details stand out, italicize it or put it in bold style. You can try using a different font color for important information to highlight them. Do not rush. Do not be on a rush when you write your resume. Give it enough time for you to be able to write an impressive content. Spell check is the key. Typos are no-nos. You should never forget to proofread your resume no matter what position you are applying for.